The Exos-9 is extremely user-friendly and easy to control. If you ever need to invite a friend to join in on the fun or just need to refresh the connectivity on your device, it's very simple. We have made resetting the device a breeze that can be done in seconds. And if you ever need any help, remember that our Customer Service team is always here for you. Contact us through the email address in your Welcome Letter. If you're not thrilled, we'll pay for return shipping and refund your purchase, no questions asked. 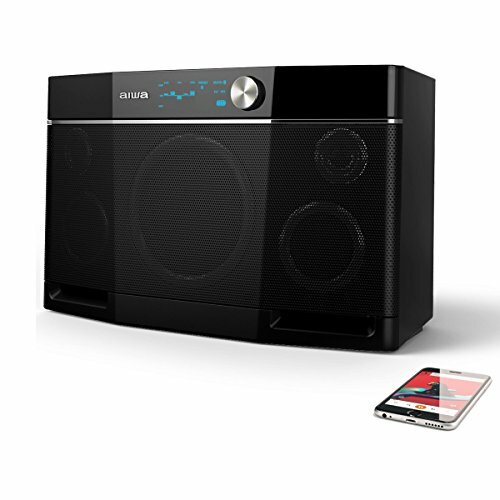 THE AIWA PROMISE - Your purchase includes a 1-year WARRANTY and a 60-day RISK-FREE SATISFACTION GUARANTEE. If you're not completely thrilled with your Exos-9, send it back for a full refund, no questions asked. We'll even pay for return shipping. HOME-STEREO SOUND IN A PORTABLE PACKAGE - With 200 watts of continuous power and 5 drivers, including a 6.5" dual-voice coil subwoofer, the Exos-9 delivers amazing stereo sound whether you're working alone in the garage or grilling with friends on the patio. Deep bass, distortion-free loud volume, no clipping. ENTERTAIN INSIDE OR OUT - Keep the Exos-9 plugged in or enjoy up to 9 hours of incredible unplugged sound with the included 57.2 Wh lithium-ion removable battery pack. Perfect for tailgates, camping, backyard fun, the beach, fishing, and any other outdoor activity where nature forgot to install power outlets. Your guests will pass out before the Exos-9 does. 110-240V compatible. ULTIMATE CONTROL OVER YOUR MUSIC - Crank the bass, mids, or highs with the 5-band onboard graphic equalizer. Use one of 4 available pre-sets or fine tune the EQ to your liking. The customizable EQ makes the Exos-9 perfect for every genre of music as well as podcasts and audiobooks. Deep bass, distortion-free loud volume, no clipping. LINK TWO FOR MASSIVE SOUND - Link two Exos-9 speakers together in dual stereo or stereoseparated configuration to entertain a 75-guest party that will surely draw the attention of your neighbors and local authorities. CONNECT IN SECONDS - Connect to your iPhone, iPad, any Android device, any Kindle tablet, Windows device, PC, or Mac via Bluetooth with aptX and A2DP support. Android NFC also supported. 3.5mm audio jack for direct connection. If you have any questions about this product by Aiwa, contact us by completing and submitting the form below. If you are looking for a specif part number, please include it with your message.